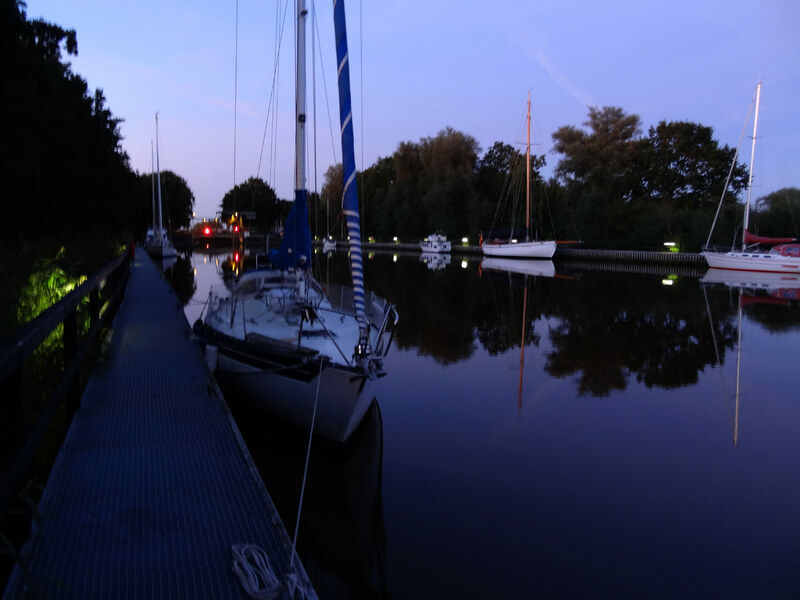 Bringing SY OLIVIA from her pre-owner´s home port at the Schlei in Northern Germany to where I live – Hamburg – is the first real ever sailing cruise. I was so excited about the prospect of this cruising trip. 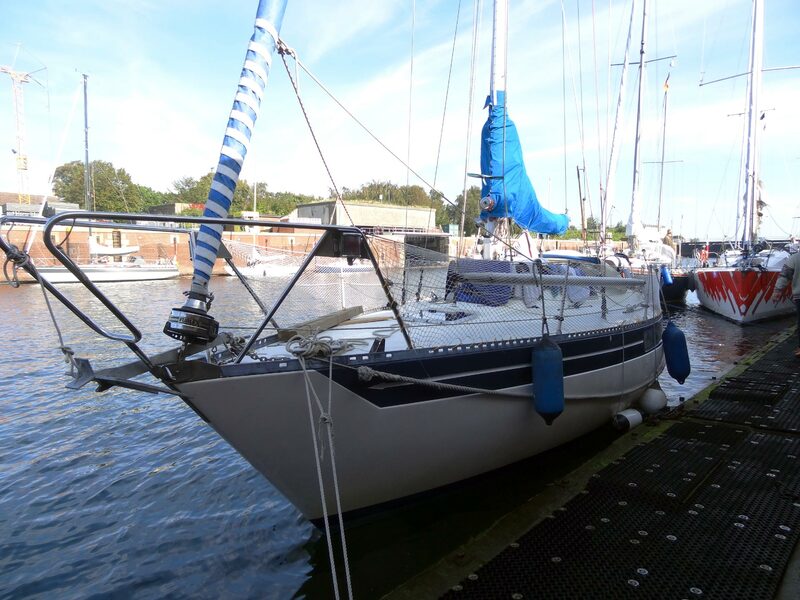 Having planned the whole trip well in advance and with the help of an experienced professional sailor – whom I may call “the Pilot” – made the whole project of transferring this 33-feet sailing yacht within 4 to 5 days to Hamburg a big thing for me and my family. Despite it being a closely calculated one, it still left enough room for adventure. 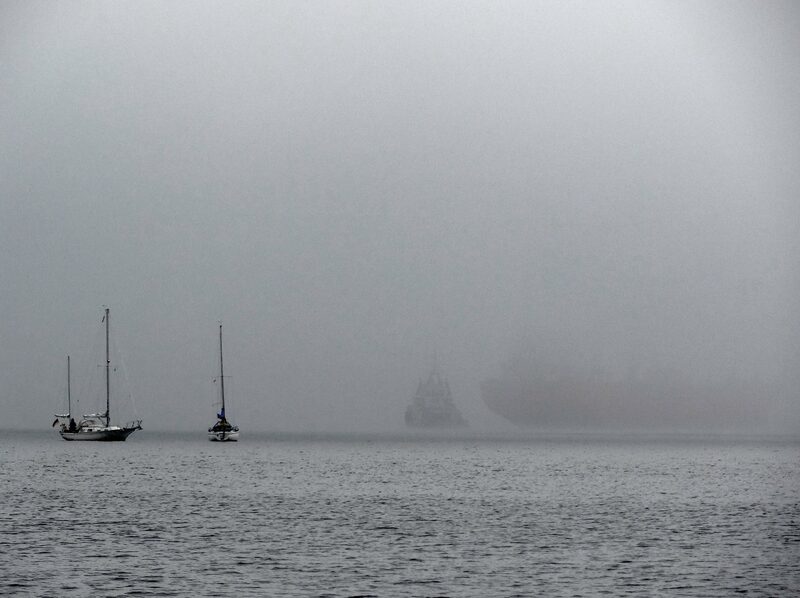 Boats are heading for safe mooring due to arriving thick fog. 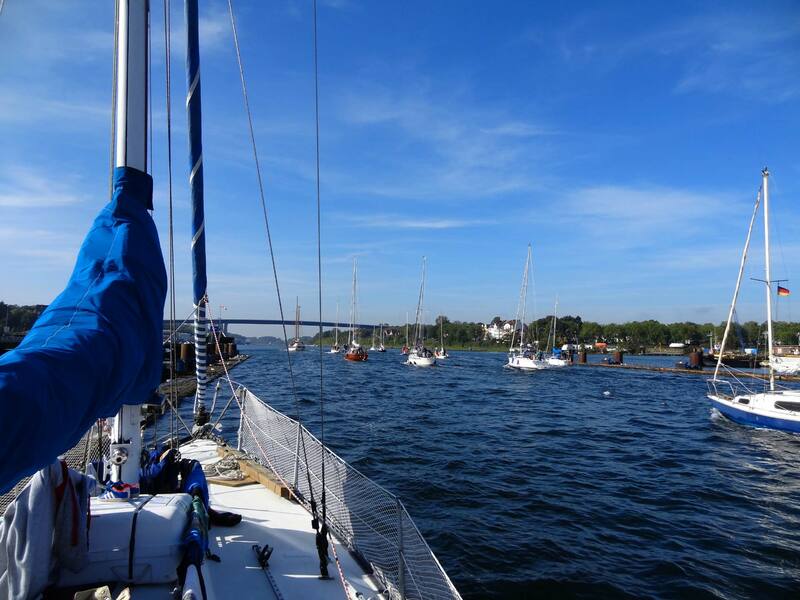 Day 1, yesterday, was already a perfect start: We had the best weather one could wish for, slight and steady winds, we were able to do 25 of the 30 miles completely under sail. It was warm, dry and a wonderful start for our venture. 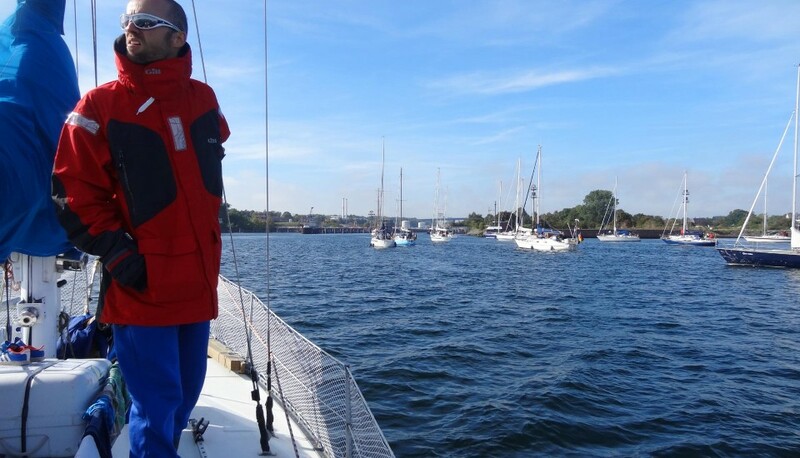 Now day 2 ahead I knew the situation would change completely: The Kiel Canal was no sailing area at all. 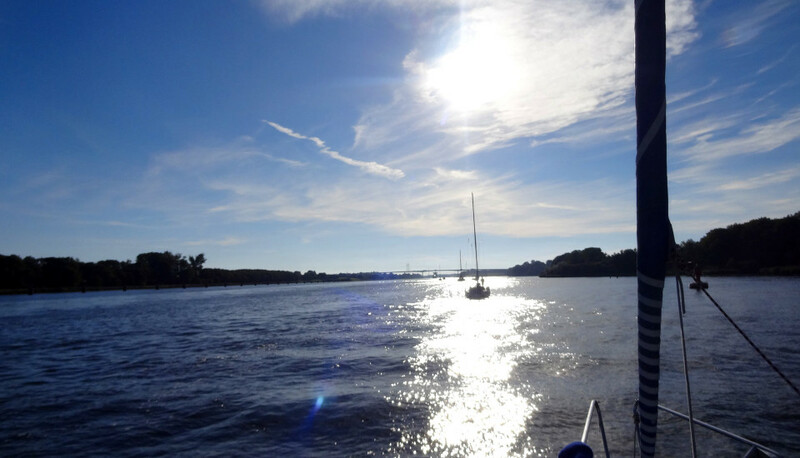 Kiel Canal: Busiest waterway in the world. Being built under Emperor Wilhelm II from 1886 to 1914 the Kiel Canal has a length of some 100 km from the locks in Kiel Holtenau to the locks in Brunsbüttel, connecting the River Elbe/North Sea with the Baltic Sea. 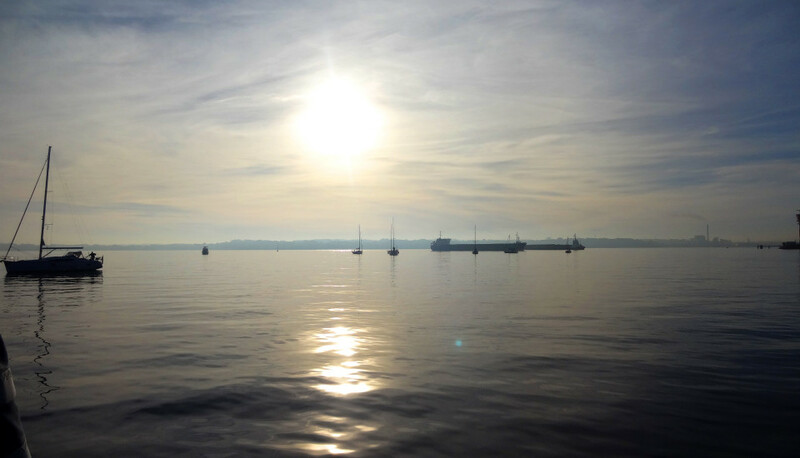 Kiel Canal has been digged out of Dithmarschen´s soil as part of the German Empire´s military buildup leading to World War One – it should enable the Imperial Navy to move their Battleships and other fleet-ships quickly between the two Oceans. But on this misty Saturday morning it was not a battleship waiting for the lock to open but a fine King´s Cruiser 33 with a crew of four: Having on board both my wife and my son and the Pilot was also a test of OLIVIA´s capabilities as a family cruiser as well. And to tell after this one first night with four persons: It was quite a successful start. Spacious enough to easily house four persons, we still even had two berths left over. So everybody found more than enough space and privacy to catch a good night´s sleep. 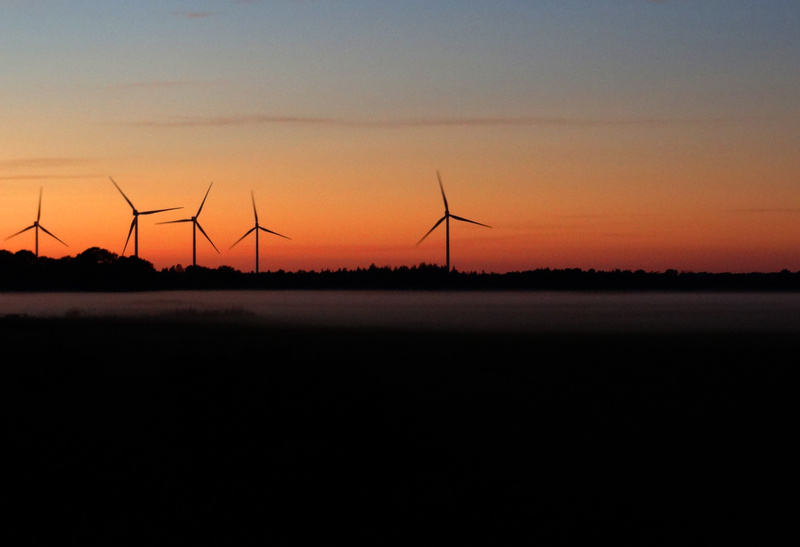 Silencing everything: Dangerous fog covers all of Kiel Bay area. Well, everyone except me, I guess: I was so excited being here that I barely closed my eyes for longer periods. Listening to the sound of the masts, the clinging of the ropes and the splashing of the water; distant horns during the night it was an all too unfamiliar soundscape as to find a deep sleep. But I liked it, very much – much more than the crowded street under my window back home. And I will certainly get used to it very fast. About 6.30 a.m. it was not my watch screaming her get-up melody but my son waking up the whole crew. Time for breakfast. Short night – long breakfast: Nervous ears on the radio. After having paid for the dinner last evening with my last cash, it was the knocking of the harbour master wanting to collect the demurrage for the night, my first duty was to run into town in search for a vending machine. In doing so, I bought fantastic smelling, still warm fresh bakery for our first breakfast on board. Returning to the boat, my wife and the Pilot have cleaned up the yacht and transformed her from a spacious sleeping-paradise back into a ship again. Standing in the pantry I fired up OLIVIA´s 3-flamed stove. Crew was longing for hot and fresh coffee and my son demanded his daily day-starter: Hot milk. Next to it our Bialetti-coffeemaker cooked up and slices of bread sizzled in the pan, later accompanied by 6 savoury flavoured stirred up eggs. Safely at the pile whilst foggy times. The Pilot was in his element: He was commenting every radio-massage and translated it for us newbees. But as his face turned even more to a grim look after every message, hi began to nervously look through OLIVIA´s porthole time and again, even more checking his watch. “Well. It seems that the Channel is closed for pleasure crafts due to fog.”, he rubbed his beard: “Problem is that yachts are only allowed to travel Kiel Canal during daylight – which is now until … seven, half-past-seven at best today.” He was calculating: If we´d travel at steady 6 knots with our boat we would make some 50 miles in around 9 hours. That´s the length of the Canal. Lock is open – hurry up to get a good place. “So, assuming we need 9, 10 hours for sailing the whole Channel, we must not pass the lock here later than 10 o´clock.” Ah, okay. That´s the problem, we understood. But having no chance to influence this situation in any way, speeding up the fog or making weather become better, I leaned back into OLIVIA´s cosy cushions and switched back to enjoy-mode. It was 8 o´clock. Still plenty of time for the fog to clear. I thought in good mood for everything to settle down quickly. But time worked against us. Casting off … and running into jam. Nervously having one of his ears always on the radio-speaker, the Pilot grew more and more impatient. As I was making a joke about him having to look at his watch every five minutes or so, he stated that this is an occupational disease: Commercial shipping depends on minutes, even more dramatic in tidal waters. I understood. 10 minutes to ten o´clock the situation was improving. 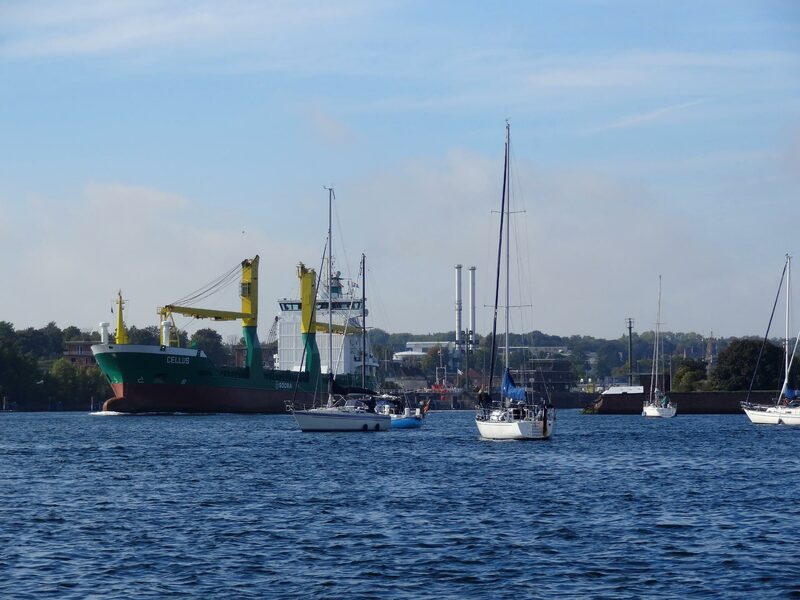 A radio emission and a seemingly clearer sky in the direction of the Channel made everyone nervous instantly, three or four yachts were casting off their ropes and slowly steaming towards the locks. “Start the engine”, the Pilot advised and readied the boat for leaving our berth. 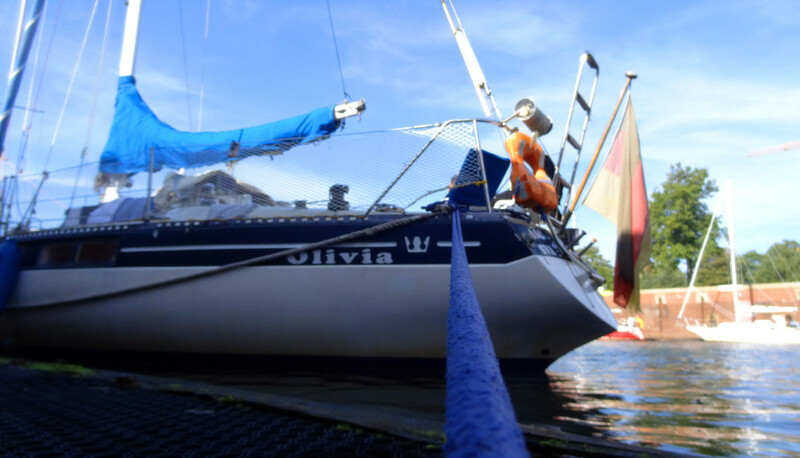 Our neighbor did the same, five minutes later OLIVIA was steaming towards Holtenau lock, the entry into the Kiel Canal. We were cruising at maneuver-speed, barely enough to create enough flow around our rudder to be able to steer our boat around and between the ever growing fleet of impatiently waiting boats roaming the small area in front of the still prohibited locks. Every now and then one of the skippers was radioing to Kiel Channel 4 asking when locking would be possible. Always a bit in a snit-like answers like “Kiel Canal still closed for yacht traffic.” gave no real enlightment to all the crews. Our yacht secured inside the lock. The overwhelming view of this attractive white cloud-front changed to grey, later even black. “Quick. Turn on the engine and let´s get back to our berth.”, the Pilot decided wisely. “Yeah, let´s move the boat out of this traffic jam.” I just imagined this fleet of unorderly sailing yachts losing sight of each other. As we steered OLIVIA back towards our old berth, some of the skippers also realized the danger and headed for the Tiessen-Kai area to safely moore. We found our berth occupied but next to it an empty pile where I was able to secure our boat. Only minutes later the thick foggy cloud came upon us, laying her wet, icy-cold cover over the whole bay. Suddenly temperatures dropped significantly, every hand not needed on deck disappeared downstairs, closing the bulkheads to secure the little rest of heat inside. The pilot and I changed watch every twenty minutes. Time went by. Radio messages grew scarce and even so all our hope to go through the locks and thus being able to cover the whole distance today. The Pilot´s mood was really down, I for myself, not having any schedule, welcomed every minute – no matter if we sailed or not – as a wonderful and valuable chance to learn. GO! The armada sprints Formula 1-like. Not until around one o´clock the situation didn´t change in any way. But slowly the fog was disappearing, more and more the sunshine was disolving the thick misty soup. When it was warmer again and radio traffic setting in, I was hurrying to clean up the pantry and make everything ready to sail again. 38 sailing yachts – a Formula 1 start for sure. Fever broke out again and some moments later the once securely moored fleet of yachts and motorboats again was cruising wildly in front of the locks, everyone waiting to get a first place inside the lock. It seemed, that now more than ever they were desperately fighting for every half a mile to cross this damn channel. When finally the lock opened up for us, we managed to secure OLIVIA on the port-side (where it was less crowded) and afar in the front of the pack. A good starting position for the race to follow. When all the yachts were moored, the skippers or their wifes hurried up the ladders to run back to the lock´s kiosk to pay for the locking service, ran down to the boats again not to miss any minute when locking was done to let lose their boats for sprinting off into the channel. Ridiculous. But understandable: There are very limited possibilities for yachts to moore underway. Besides, having reached the Elbe would mean that every further mile of sailing would have to be coordinated with the river´s tide. And every day the tidal times would shift one hour. 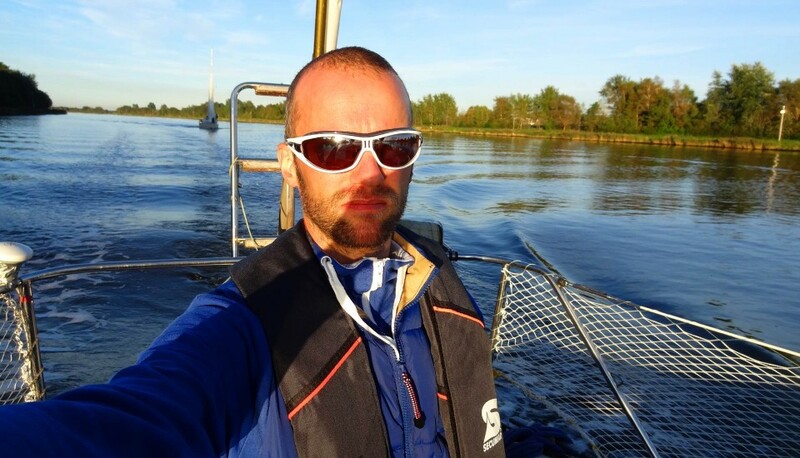 So losing one day in the Channel means to lose one precious hour of favourable tidal currents up- or downriver Elbe. A calculation we would have to make as well. But not today: The Pilot stated clearly that it was impossible for OLIVIA to reach Brunsbüttel that very day. The Channel opens up – will get narrower soon. 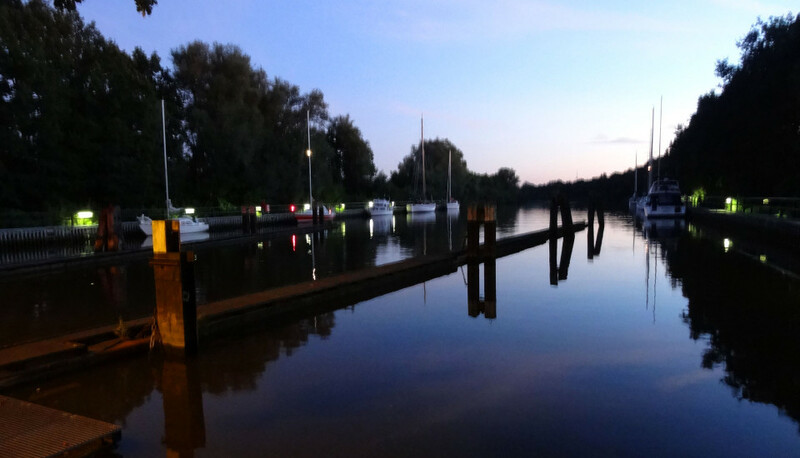 Instead, it even was at stakes to reach our pre-planned mooring-place for tonight: Gieselaukanal. “We have to go at steady 6 knots. We cannot afford delay or mishap. Otherwise we´d have a problem.”, he said. 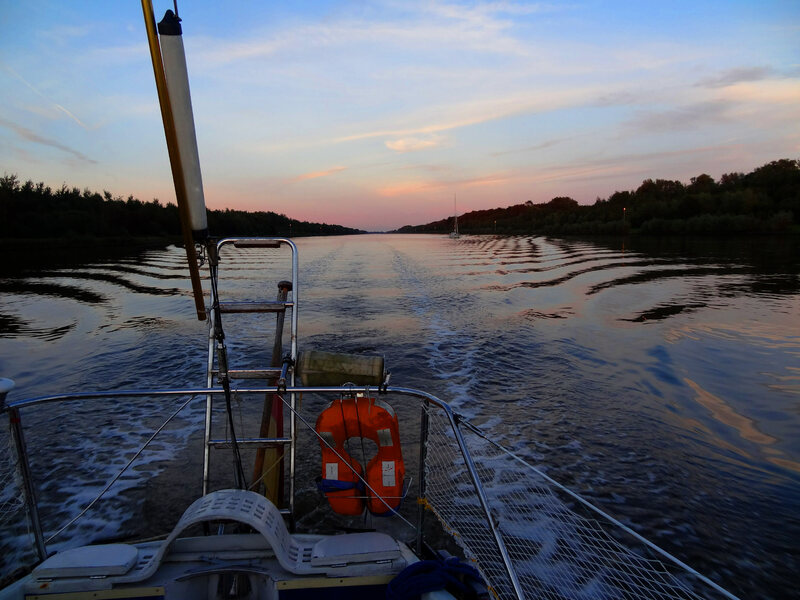 Sailing Kiel Canal after sunset was strictly forbidden – mooring scarce on the other hand. 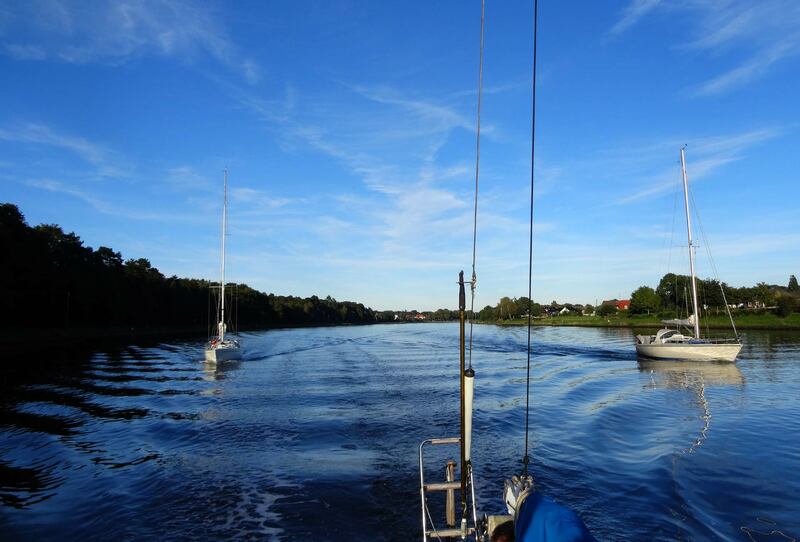 In the Kiel Canal: Boring travel under engine? The hustle was over as quick as it set it. The fast boats disappeared behind the first corners of the Channel, the majority of the yachts stayed astern and we lost sight of the main armada after one or two hours. Of the 38 yachts I was counting whilst locking, some 9 yachts remained a speed similar to ours – we kept a distance of several hundred metres to each other. “Seems like they are also heading for Gieselaukanal”, the Pilot stated. 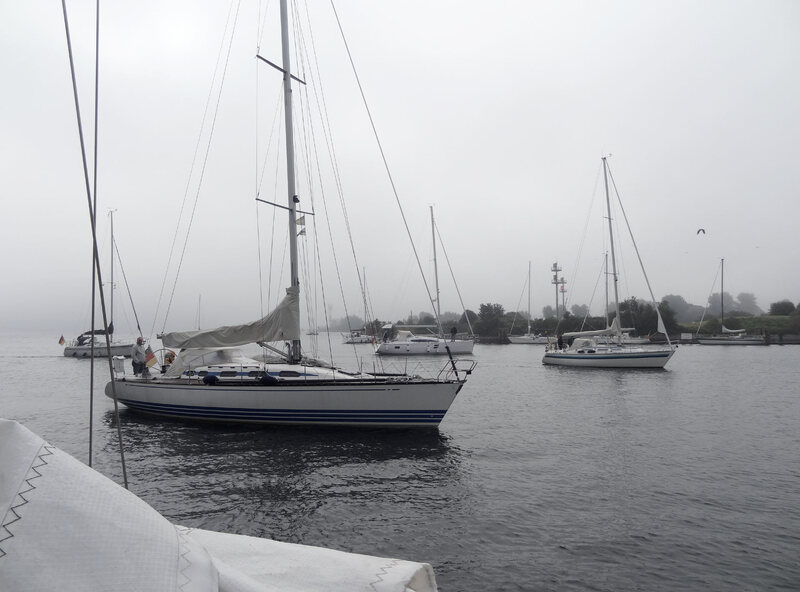 “Would mean that the others behind us are keeping it slower to anchor in Rendsburg or nearer.” I nodded. Always having an eye on engine temperature, oil pressure and amount of Diesel in OLIVIA´s bunker. Big ships passing by: Daily business on Kiel Canal. 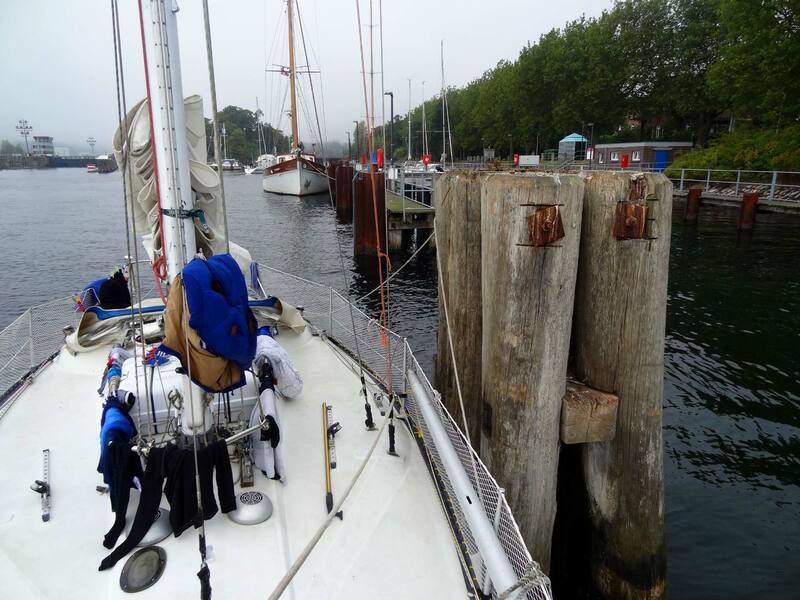 Sailing Kiel Kanal is considered boring. An inconvenient must. A necessary evil. Very few corners to take. High trees to the left and right blocking every sight of the Dithmarschen called northern german area. The neverchanging sound of our Diesel engine running at 1.800 rpm with 6.1 knots on the log was going on our nerves, a constant rumble, nothing to do on the helm just keeping steady course. Tiring one hour-shifts at the helm. I was astonished seeing my Volvo Penta MD2030 engine consuming just around 30 litres of Diesel in the end. My fear that the full bunker of gasoline wouldn´t be enough for the trip, that was really an interesting lesson and another good learning about OLIVIA´s character. 9 Bridges to Brunsbüttel locks. 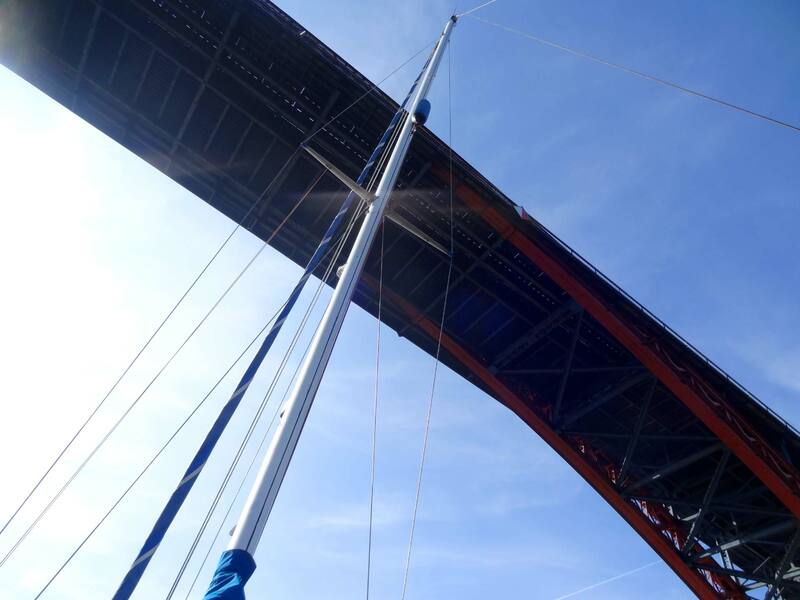 A sailor doing the Kiel Canal shortcut between the Baltic Sea and the North Sea would have to go under 9 Bridges until he will reach the end of his journey. Highways and Autobahn as well as train-bridges had to be crossed. Some of them being as old as the Channel itself – such as the huge iron bridge in Rendsburg, featuring a tourist attraction: The floating ferry, still working after 103 years. Other bridges of newer dates, effective concrete-constructions without any aesthetical approach or architectural soul to them. A Kiel Canal traveler will also pass famous Lürssen-Werft, one of the world´s leading manufacturers of luxurious big motor-yachts. As we were passing we could get a glimpse of one 70-80 feet long ship clearly being outfitted. 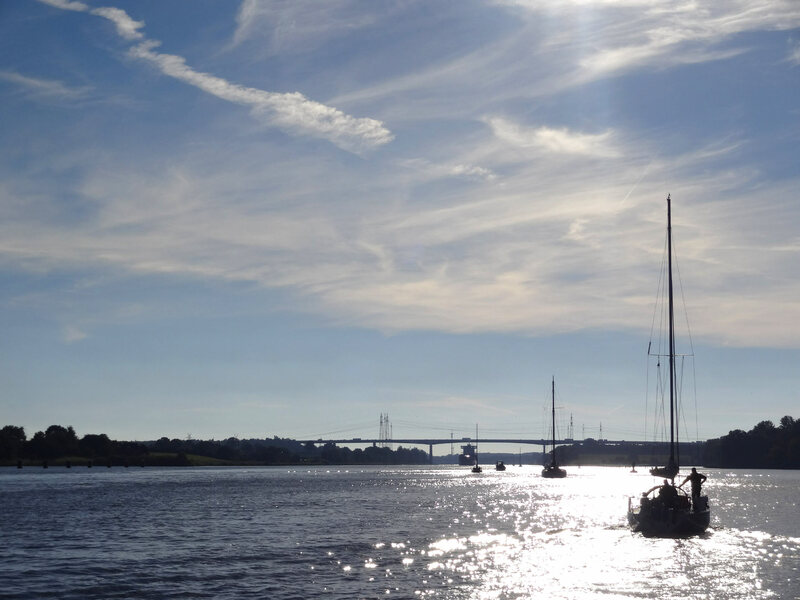 Nine bridges have to be passed all along the Kiel Canal. Also, some 14 ferries will have to be crossed. The Pilot told the story of Emperor Wilhelm II who, as he was ordering the channel to be built stated, that “if the state shall cut through the land of the people for commercial reasons, it is an obligation for the state to provide for safe and free of charge crossing of the channel.” So, until today, you won´t have to pay the ferries over Kiel Canal. We won´t make it in one day. Sun went down every minute, colours changed to deeper red tones. Air began to smell colder. An unmistakable sign for the day reaching it´s end. Behind us it was just two yachts in sight, barely any radio transmission was revealing that traffic on this day was barely none on the busiest waterway in the world. “Allright, let´s recap”, the Pilot said: “We still have 12 miles to go and sun goes down in … 2 hours.” Well, running at 6 knots steadily would thus bring us to Gieselaukanal just in time to get OLIVIA to her berth with last sunlight. “Check all the lights”, the Pilot ordered and I went down to switch on my boat´s position lights, anchor light and her aft steaming light. Taking a round trip on her deck I checked for every lamp, sending my thumb up to signal the cockpit that OLIVIA was ready for running in the dawn. On this very day we´ve had the Channel for our own. Down below my son was slowly waking up after a long sleep – the constant evenly sound of our Diesel, the light rolling of the ship combined with the fresh air makes a child sleep so deep and peacefully like nothing. Of all of OLIVIA´s crew, my little son was the most relaxed. He was up just right: Mooring is always a exciting maneuver, preparing a hot dinner for the whole crew before a good night´s sleep the crowning of yet another successful day on board. Darker it went. Some minutes ago I couldn´t get my eyes off the pink and red and orange reflections of the sun in the water, now there was just a deep endless black below us – over our heads with no interfering citylights the whole baroquee grandeur of a clear sky with thousands of shining stars was taking away my breath. 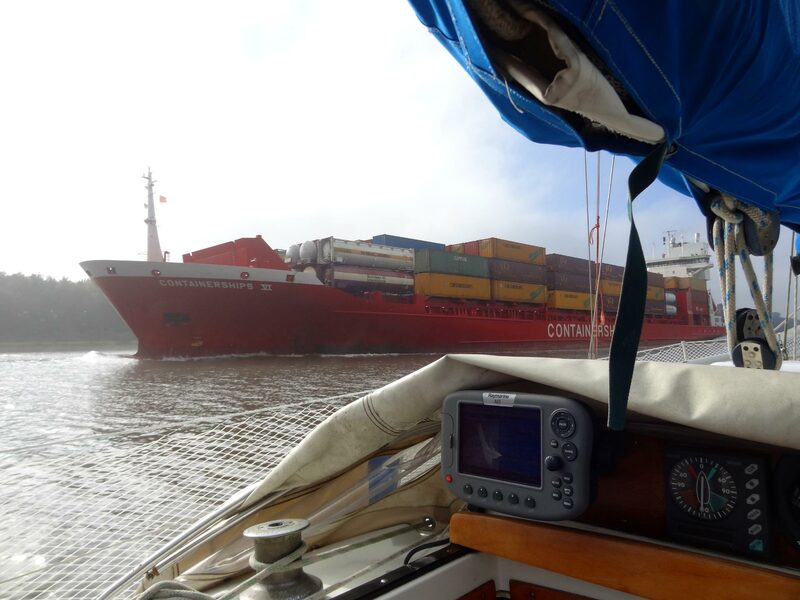 “There´s the entrance to the channel!”, the Pilot chanted, reducing speed for the first time since we had left Holtenau locks hours ago. 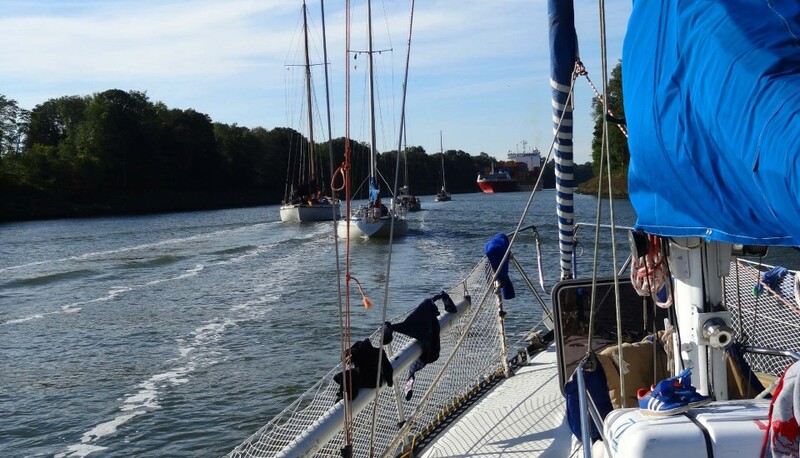 Last mile for today on the Kiel Canal. When OLIVIA was prowling through this sidearm of Kiel Canal, still some half mile to go, we reduced further speed to half a knot. Feeling relieved and freed of the burden of today´s task, I was so much looking forward to endlich mooring our boat, having it quiet again in the ship. Under the meagerly shine of my decklights I prepared the fenders and the ropes whilst the Pilot was slowly turning the boat to maneuver her into mooring alongside a 200 meter long pier. “Stop the engine”, I was giving the order this time. Landing the boat and securing it to the pier. Suddenly it was quiet. “What a … beautiful place …”, we all three stated together. This was truly paradise. SY OLIVIA mooring with some other yachts in Gieselaukanal. Having it quit now was a relief for our ears – our whole body. We cleared deck and after I got put on another layer of war,m clothing I was ready to explore our hostng environment. I felt like having made a little cercumnavigation, stepping off my boat, feeling solid ground under my boots again. What a feeling! Gieselaukanal is the connection between the River Eider and the Kiel Canal. Our berth just at the entrance to a lock between the two waterways. No traffic at all, we´ve had some other 6 yachts mooring here at this Lonely Planet-spot with us. There was nothing here. Just a newly built pier to both sides of the channel, some lights and near the lock-house bathrooms. No shop. No people. No nothing. Perfect. I roamed about, shaking out my legs that haven´t been used today that much. My son and wife with me, we took a short walk of 30 minutes to gather further hunger and as we returned I prepared a hot dinner (Tortellini with Sauce Bolognese). We sat together in OLIVIA´s saloon and again – it was perfect. Empty northern german landscape – called Dithmarschen. Of course we had. Just two cans. But guess what? Sharing this one little litre of beer among us three, drinking it slow with indulgence and having a good talk sitting in our saloon with candle light was pure joy. Was pure satisfaction. This night I catched a very deep, very satisfied and smooth sleep. Having experienced a very different side of sailing today I could not be thankful enough for all the precious and valuable impressions and learnings that this trip brought. When I slept, I could have had a slight smile on my face: Looking so much forward to yet another very different kind of sailing tomorrow, our third and last day: This time out on River Elbe, a crowded, dangerous, busy water with high tidal currents, even bigger ships and tricky sailing conditions changing every mile. What are your experiences with travelling under engine in your yacht? I am looking forward to your comments. 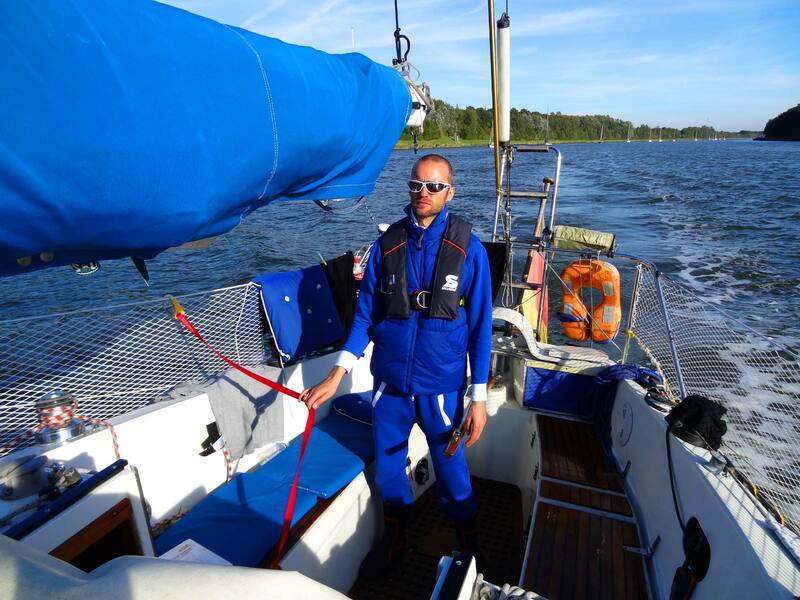 Previous Post	Yachtmaster´s exam: I am a Sailor. In theory. Next Post	Prepping your yacht for winter-storage.